The FN SCAR is the semi-auto version of the newest service rifle of U.S. special operators. Light, fast-handling and quick shooting, the FN SCAR 17S is chambered in .308 Winchester and features a free-floating, cold hammer-forged MIL-SPEC barrel with chrome-lined bore. Fully-ambidextrous operating controls instantly adapt to any shooter and any shooting position. The receiver-integrated MIL-STD 1913 optical rail and three accessory rails enable the mounting of scopes or electronic sights, plus tactical lights and lasers. The telescoping, side-folding polymer stock is fully adjustable for comb height and length of pull. 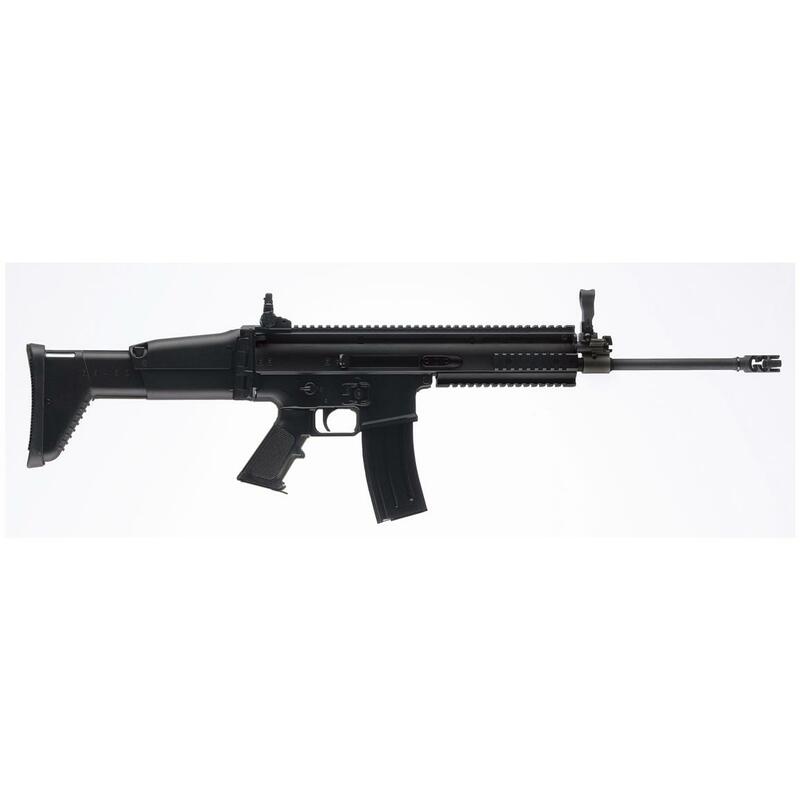 FN SCAR 17S, Semi-Automatic, .308 Winchester, 16.25 Barrel, 20+1 Rounds is rated 5.0 out of 5 by 1. Rated 5 out of 5 by SCARred For Life from The Best Civilian Tactical Rifle Ever Made! The FN SCAR 17S is the best civilian tactical rifle ever made. You can take this sweetheart to the range and shoot all day and still not have a sore shoulder. The gas piston system is designed to minimize the recoil making the rifle pleasurable to shoot for long periods. Unlike gas impingement systems, the receiver stays clean and I have not encountered any FTFs (Failure To Feed) or FTEs (Failure To Eject). This rifle is extremely accurate and easy to operate. It comes with a 20 round mag, but a 100 round double mag drum is available for some serious fire power! The 17S comes with easy flip-up iron sights, but I also utilize a 6-24 X 50mm detachable long range scope for those extra long range shots. I also included a detachable pan spring loaded bi-pod that allows me to quickly adjust to any target. The standard multi position stock and cheek rest are first class. The FN SCAR 17S is designed to meet all of the shooter's needs for flexibility, comfort, quality and accuracy combined into one fantastic compact package.I also have the FDE FN SCAR 16S (FN SCAR 17S' little brother) which is my short range go to rifle. Like the 17S, it also comes standard with the flip-up iron sights, but I have added greater flexibility with a detachable EOTech red dot scope and 7X FTS (Flip To Side) magnifer that can be quickly pushed to the side when not needed. I also have a detachable digital night vision scope than can be used day or night. The SCAR rifles provide the flexibility to include many options. My night vision scope eliminates the need for a traditional flashlight, but there are mounts provided for that option as well as lasers, grips or any other Pica-tinny type accessory.The old saying, "You get what you pay for" really applies to the FN SCAR rifles. The quality is unbelievable and well worth the additional cost. Regular AR -15 gas impingement rifles are just no comparison to the FN SCAR rifles. Tack drivers have always been the nickname for .22 rifles, but now a shooter can have that same capability and accuracy with much higher calibers. The FN SCAR is definitely "The Best Civilian Tactical Rifle Ever Made!"